In this chapter, I illuminate a hero and shed some light on how to use LEDs. As I said before, we didn’t get though the closing credits of Big Hero 6 before we started talking about which characters we might want to cosrun. Jennifer decided on Honey Lemon, but I don’t know which one of us was more excited about her costume. I thought Honey Lemon’s bag was really cool and I started putting the design together right away. Jennifer and I usually bounce costume ideas off each other and this was no exception. We started by discussing the overall design of her costume, and where she wanted to land on the scale between subtle inspiration and full on cosplay. We decided to go fairly subtle with the costume and as realistic as possible on the bag. We sat down and looked over running clothes that would work best for the costume, which ended up being a purple tennis dress, coral mock turtle crop top tank, and black leggings. 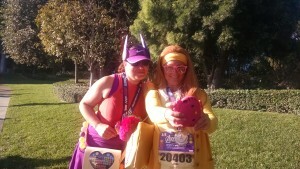 Jennifer picked out a purple visor that I would make look more like Honey Lemon’s helmet by adding foam pieces. 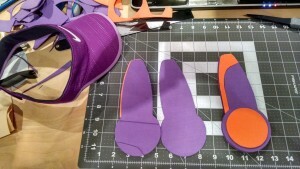 I was really excited about our costumes for this race, so I got started on creating several of the components right away. I had the graphics for Fred’s shirt and hat done in a day and the touch screen for Honey Lemon’s bag roughed out shortly after. Once I replicated the movie-accurate touch screen, I struggled to make sense of the periodic table they used. Ultimately, I chose to create my own version of the touch screen, which followed a more traditional table of elements while maintaining the basic look of the source material. I also created graphics for the tank top, which suggested the look of Honey Lemon’s armored breastplate. I decided to make the bag out of craft foam to keep it as lightweight as possible. I started by making a mock-up out of paper to get the size and shape right before finishing it in beige craft foam with black structural pieces on the inside to help keep it together. 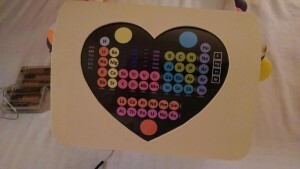 I printed the touchscreen on glossy photo paper and used double sided tape to attach it behind a heart-shaped hole I cut in the front of the bag. Once I had those pieces done, I kind of hit a creative wall and wasn’t sure how the rest of the bag was going to come together. I toyed around with the idea of using LED lights, but hadn’t used them before and wasn’t sure how well the bag would hold up with a battery pack. So, I set the bag aside and worked on pieces for other costumes. As race day got closer, I knew I had to get moving on it, so I focused more attention on finishing the bag. 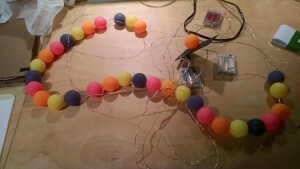 I decided to order a couple strings of LED lights to play with and strung multi-colored ping-pong balls on them… it looked really good, so I moved forward with that plan. 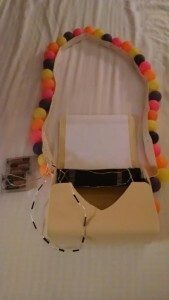 I attached a strap to the bag with glue, and used loops of thread to attach the LED/ping-pong ball strand to the strap. The battery packs were too heavy to put in the bag, so we settled on a plan to put the packs in a sport belt with a pocket that would allow the batteries to sit on Jennifer’s lower back beneath her costume. I ran the LED string from Jennifer’s back to the bag through a hole in the tennis dress. It wasn’t ideal, but it was a good work around. At this point, I had enough of the bag together for a dress rehearsal and all looked good. When I did an LED check with the lights off, I noticed that a little light was coming through the photo paper, but I was running out of time to make any big changes before Wine & Dine. Before we left, I made a few changes to the touchscreen design and reprinted it on a transparency sheet, but it was way too transparent, so I printed the new version on glossy photo paper and taped it on the bag with a blank transparency sheet over it to make it even glossier. I was really happy with how it turned out, but the lighting issue still nagged me a little. I was out of time, so I let it go. Surprisingly, the bag survived the trip to California, by way of Florida, without too much damage, but I did need to fix a couple things and make some last-minute alterations. after another lighting test in the hotel room, it was clear that if I shifted more of the LED string inside the bag, there would be enough light to make it glow through the screen. I used black electric tape to line the inside of the bag, since light was now showing through the foam, and I trimmed some of the extra foam that was blocking light to the screen. These minor changes made a big difference and really helped pull the whole thing together for race day. The weather in California always seems to be perfect, and that weekend was no different. Jennifer and I usually run 10K races together, and since I was still nursing a foot injury and had the Avengers half marathon the next day, she walked it with me. As expected, her Honey Lemon costume stole the show. In my opinion, her bag is one of the best costume pieces I’ve created up to this point and it got a ton of attention and compliments. Since it was dark when we left the hotel and entered the staging area, the lit bag was immediately noticeable and got a lot of attention as soon as we stepped out of the hotel room. People stopped us for pictures the whole way and continued doing so as we stood in the corrals. There were a lot of versions of Honey Lemon on the course, but none of them had a bag as cool as this one (if I do say so myself). Leading up to the race (when we expected to run at least part of it), I had worried that it would bounce against my leg and annoy me. But between a few strategic safety pins that kept the bag firmly in place and the fact that we were walking, there was no bouncing problem. As the sun came up and the light-up feature was less obvious, people started to notice the other details like the helmet and armor iron-ons. Overall this was a really comfortable costume that had a lot of visual impact. I STILL love this costume! 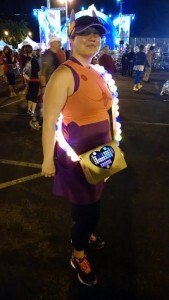 It stands out as my favorite costume I’ve every seen at a RunDisney race (I was at Superheroes in 2015)…so much so that I mention you in a youtube video featuring a RunDisney Tag! You can check out my channel (the new video will be up on 10.3.17) in the link below! Nice job on this one!